At New Dawn Chiropractic & Acupuncture, we take great pride in providing the finest chiropractic care to each and every patient. We have included information below about the different chiropractic and acupuncture services offered in our Arvada chiropractic office, but please call us at 303-420-7707 if you have any questions! We provide advanced spinal correction and chiropractic adjustments utilizing "state of the art" chiropractic techniques. Never in the history of chiropractic care have chiropractors been able to provide the level of help and expertise that is available today. Many of the newest chiropractic techniques are actually safer, more comfortable and more effective than ever before. As a chiropractor who cares about utilizing the most advanced chiropractic techniques, Dr. Julie Henderson has years of training, expertise and experience in helping patients get pain relief for back pain, neck pain, headaches, and other related conditions originating from the spine. Chiropractic care under a trained professional can even be used to prevent injuries and help you achieve total health or wellness. Acupuncture is a 5,000 year old Chinese system of natural healing with the goal of restoring proper energy flow to the body. Over 200 conditions have been treated with acupuncture, but the main focus is on the healing of the systems of the body. 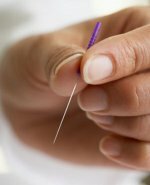 Since the late 1990s acupuncture has been proven effective in multiple studies highlighted by the National Institute of Health, including osteoarthritis, post-traumatic stress disorder and chronic low back pain. At New Dawn Chiropractic & Acupuncture we find that for many of our patients, the combination of chiropractic care and acupuncture treatments can lead to a better functioning body overall. We find and treat the cause of our patient's symptoms, leading to better overall health. Kinesio tape and Rock tape are unique elastic, non-latex tapes that are used to stabilize and support the muscles and joints of the body while still allowing maximum range of motion and maximum blood flow. These tapes can be used to treat neuromuscular, orthopedic and neurological conditions. Some applications include: shoulder pain, achilles tendonitis, carpal tunnel syndrome, foot pain, headaches, low back pain, shin spints, lymphoedema, and the list goes on and on. Both types of tape can be worn for extended periods of time to maximize the therapeutic benefits in between visits to your doctor. At New Dawn Chiropractic & Acupuncture we utilize kinesio and rock tape not only for injuries, but to enhance the function of the tissues in the body. 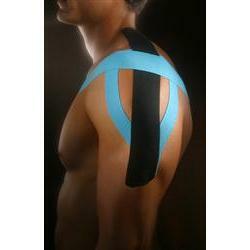 Ask us about what taping can do for you! At New Dawn Chiropractic & Acupuncture, we teach our patients how to perform special "blueprint" exercises which can help strengthen and correct the irregularities in their body which may be causing pain. Many of these corrective exercises can actually be performed in the comfort of your own home to help improve the effectiveness of your chiropractic care and spinal correction plan. In addition to skeletal misalignment, you may be experiencing pain that is caused by muscles and connective tissues which are out of their proper place. Other types of pain such as back pain, neck pain, and headaches are caused by muscles and tissues that are being used improperly, causing injuries over time. In each case, targeted corrective exercises and stretches from our experienced chiropractor will help you feel good while also helping your body achieve balance and health. What does nutrition have to do with chiropractic care? The goal of chiropractic care is to help patients achieve total health and balance with their body, and as part of that goal we provide specific recommendations on nutritional supplements and healthy food choices. Nutritional counseling by our experienced chiropractic health professionals can assist a patient on their return to optimal health. Do you know which supplements and vitamins are good for you? Do you know how these supplements and vitamins interact with one another? At our Arvada chiropractic clinic, we can provide each patient with a structured nutritional program that is based on their individual needs. Many of our patients bring in their middle school and high school athletes for pre-participation sports physicals. Dr. Henderson is certified by the state of Colorado to examine, assess and determine clearance for athletes to participate in the sport of their choosing. Our office offers affordability and covenience for those last minute physicals too! Most athletes are seen within two business days of calling for an appointment. So don't delay, schedule your athlete today! There is a saying that an ounce of prevention is worth a pound of cure. Your spinal health is no exception. Posture and spinal screenings by a trained and experienced chiropractor such as Dr. Julie Henderson can help reveal important health information, unlocking the door to improved health and well-being. In order to help the Arvada community, we provide screenings at area malls, community events, health fairs and places of employment. Contact us today at 303-420-7707 to arrange a screening at your event or workplace.